Something as simple as shopping for a toothbrush can become overwhelming when you realize how many options there are. Dental manufacturers will stop at nothing to convince you that their product is essential to proper oral health. For this reason, many patients are curious to know if electric toothbrushes are better than manual ones. Let’s get straight to the point. Both types of toothbrushes can clean the teeth safely and effectively. However, they each have pros and cons which may sway your decision when it comes to point of purchase. Today, your general dentist in Denver at Metropolitan Dental Care weighs in about the manual vs electric toothbrush debate. The American Dental Association (ADA) offers a Seal of Acceptance for products that have been proven safe and effective. Anytime you are shopping for an oral healthcare item, it is always a good idea to check for that seal, which can be found right on the label. In fact, our doctors don’t recommend a product unless it has been approved by this prestigious organization. It is important to note that both manual and electric toothbrushes have been approved by the ADA for consumer use. However, not every manual and electric brush has been approved, as products are tested on a case-by-case basis. Therefore, while certain brushes will have the Seal, others will not. That is why it is so important to check the packaging before purchasing. 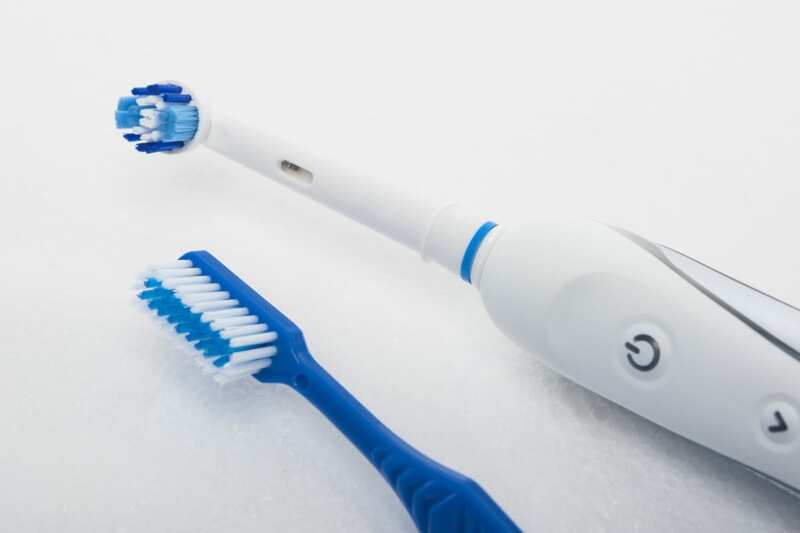 One of the most significant benefits of an electric toothbrush is its ease of use, especially among individuals with limited mobility. If dexterity is an issue, the toothbrush can do most of the work for you. In fact, some studies reveal that electric brushes are actually slightly more effective for removing plaque compared to their manual counterparts. Furthermore, many individuals feel that an electric brush helps them focus more while brushing. Several of these devices even have built-in timers which tell you when you’ve brushed long enough. Electric brushes are considerably more expensive than their manual counterparts. Depending on the brand and style, they can cost as much as $250. In addition, it can be difficult to find the correct replacement brush heads since every department store carries a different variety. Manual toothbrushes are incredibly affordable, costing around $3 on average. In addition, they are always easy to find; they can be bought at any pharmacy, grocery store, or gas station. While electric brushes obviously need to be charged up to function, this is not necessary with traditional manual brushes. To sum it up, if you currently use a manual toothbrush successfully, there is really no reason to make the switch to electric unless you just want to. There really aren’t many disadvantages to manual brushes. Some individuals feel that they brush too aggressively with a manual brush, and for this reason, choose electric. Others prefer a timer on their toothbrush, and therefore avoid manual brushes. It really comes down to personal preference. If you are curious about which type of brush to use, our team is happy to talk with you during your next dental visit. To learn more about proper oral hygiene practices, schedule an appointment with your Denver dentist today. Metropolitan Dental Care is also proud to serve the surrounding townships of Parker, Lone Tree, Centennial, and Highlands Ranch. Reach out to a team member by calling 303-534-2626 or contact us online anytime.